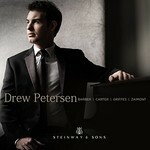 Steinway & Sons releases Drew Petersen’s debut album featuring music by American composers - Samuel Barber, Charles Tomlinson Griffes, Charles Ives, Elliott Carter, and Judith Lang Zaimont. 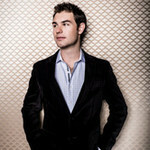 Drew Petersen joins the distinguished roster of Steinway & Sons artists! Drew Petersen, a pianist and University of Indianapolis artist-in-residence, received the prestigious 2018 Avery Fisher Career Grant on Thursday. Petersen, 24, joins the ranks of Indiana’s own violinist Joshua Bell, who won the grant as a teenager and later went on to receive the $75,000 Avery Fisher Prize in 2007. His performance will be broadcast on the radio station and its website wqxr.org at 9 p.m. April 24. Petersen will be honored as an Avery Fisher Career Grant reciepient in a ceremony at the Jerome L. Greene Performance Space at WQXR. The performance will be streamed Live on Facebook at 6pm EDT March 22, 2018 and will be broadcast on 105.9 FM and www.wqxr.org Tuesday, April 24 2018 at 9pm. laude from Harvard when he was only 19.
was only 20? It’s too good!’” he says. Drew Petersen had been playing professionally for eight years when he first tackled Chopin’s Piano Concerto No. 1 at the age of 13. It might not have seemed extraordinary to him at the time. After all, this achievement was par for the course for the precocious musician. He will be performing this work again on Nov. 11 with the Carmel Symphony Orchestra. Petersen, now 23, was presented at Carnegie Hall’s Weill Recital Hall at age five. At age nine, he performed a solo recital at Steinway Hall in Manhattan for the company’s 150th Anniversary. Since then he’s been performing nationwide and taking top honors at five major piano competitions. But his performance schedule didn’t put a damper on his education. He received a B.A. in Liberal Arts from Harvard at age 19. And he completed his undergraduate musical studies at Julliard, where he was recently accepted into the Artist Diploma Program. Petersen’s resumé is certainly spectacular — he is the winner of the 2017 American Pianists Association Classical Award, after all — but he’s not flashy in his approach to the piano. He’s more interested in, as he says, “opening a conversation with an audience,” than impressing with virtuosity. Charles Griffes’ impressionistic Fantasy Pieces to Elliott Carter’s rigorous and thorny Piano Sonata. Pulling it off took not only technical chops, but also a good deal of mental fortitude. If the task was arduous, though, it didn’t show. This early spirit of inquiry and inventiveness, as his concert demonstrated, continues to set him [Drew] apart." Winner of the American Pianists Award and the Christel DeHaan Fellowship of the American Pianists Association. There may be fewer days at the beach for Drew Petersen, a resident of Springs and Oradell, N.J. In April, at age 23, Mr. Petersen, a prodigy who first performed at Carnegie Hall’s Weill Recital Hall at age 5, won the American Pianists Award and the Christel DeHaan Fellowship of the American Pianists Association. He has also been named artist-in-residence for two years at the University of Indianapolis, where the association is based, starting in the fall. A 19-year-old graduate of Harvard University. And now, at 23, the 2017 winner of the American Pianists Award. To some, Drew Petersen’s latest feat is the culmination of 18 long years of hard work. But to Petersen, it’s just the beginning. A 23-year-old, internationally acclaimed pianist and winner of the 2017 American Pianists Awards will serve as the Christel DeHaan Classical Fellow and Artist-in-Residence at the University of Indianapolis. The Indianapolis-based American Pianists Association has announced Drew Petersen will serve as the artist-in-residence at the University of Indianapolis. The 23-year-old earned the spot after winning the 2017 American Pianists Awards. UIndy announced the artist-in-residence program in June. Petersen will serve in the role for the 2017-2018 and 2018-2019 academic years, during which time he will conduct guest lectures, master classes, public performances and private lessons for students. He will also perform with the UIndy Chamber Orchestra. American Pianists Association names Drew Petersen the 2017 American Pianists Awards winner, following rigorous 13-month competition. Drew Petersen sits comfortably at a piano, looks briefly at its 88 keys, shuts his eyes, positions his fingers, and plays from memory a complex piece by Frédéric Chopin. Petersen welcomes challenging adventures, musical and otherwise. He enrolled in Harvard’s Extension School at 14, while maintaining a demanding concert schedule.